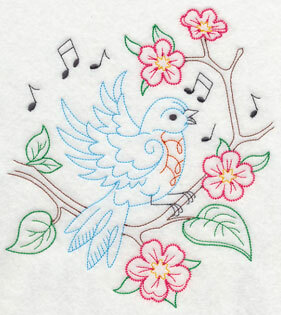 Spring is on the way, and we're branching out with new designs to bring a fresh look to your garments and home decor. 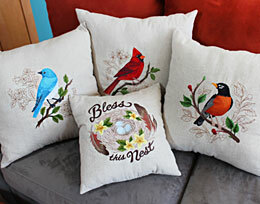 with sweet sentiments on pillows and wall hangings. Fly down the page to see these magnificent new designs! Enjoy! Cheerful pink feathers make flamingoes a wonderful addition to garments and home decor. 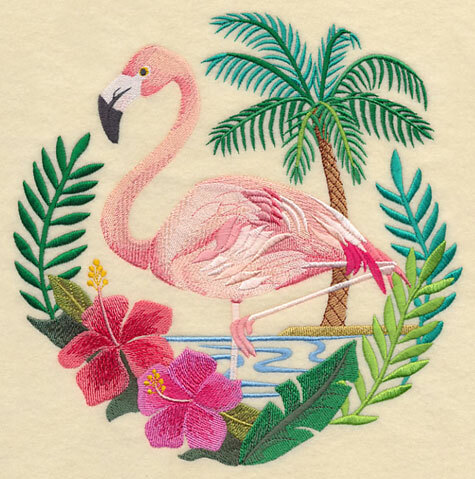 This flamingo is framed by a palm tree, hibiscus flowers, and other tropical greenery. 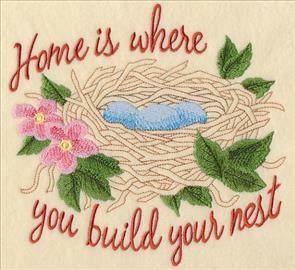 Bring warmer climes and tropical vacations to your projects with this design! 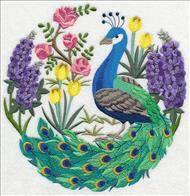 8.60" x 8.66" and 7.75" x 7.81" and 6.91" x 6.96" and 5.85" x 5.89" and 4.86" x 4.89"
A colorful peacock is beautifully circled by flowers and tail feathers. 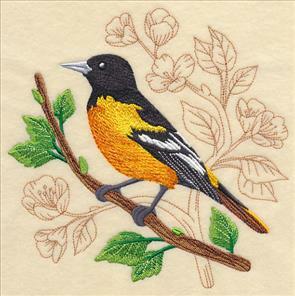 A stunning addition to tote bags, pillows, wall hangings, and jacket backs. 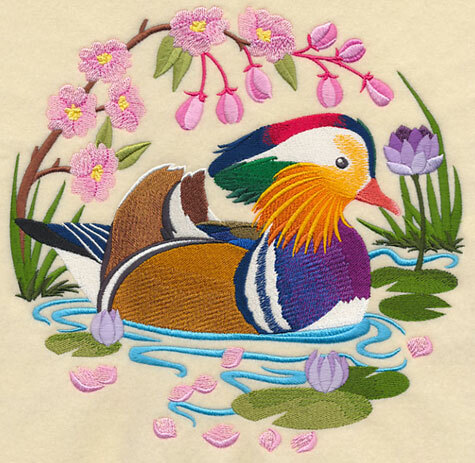 8.60" x 8.70" and 7.70" x 7.79" and 6.89" x 6.97" and 5.87" x 5.94" and 4.87" x 4.92"
Mandarin ducks are known for their colorful feathers. In China they're known as yuan-yang, and symbolize peace, fidelity, and loyalty. 8.83" x 8.60" and 7.78" x 7.58" and 7.08" x 6.90" and 6.06" x 5.90" and 5.00" x 4.87"
Snowy egrets make their homes in wetlands. 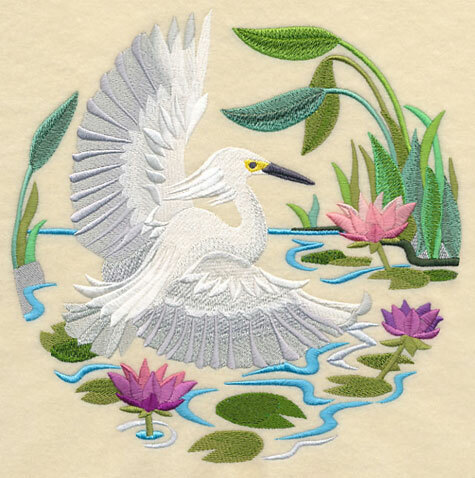 In this design, an egret takes flight from a pond. Its magnificent wingspan fills the space, framed with colorful foliage. Beautiful on tote bags, pillows, and framed pieces. 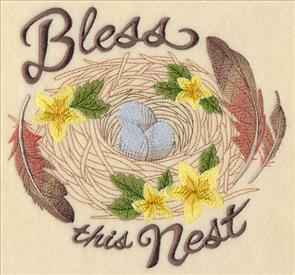 8.63" x 8.60" and 7.81" x 7.78" and 6.90" x 6.87" and 5.87" x 5.85" and 4.87" x 4.84"
Feather your nest with sweet sentiments! These nest designs have open areas, so your background fabric will show through. Colorful eggs and flowers add bright hues to pillows and wall hangings. 7.28" x 6.91" and 6.18" x 5.86" and 5.13" x 4.87"
Pair the designs above with your favorite birds. 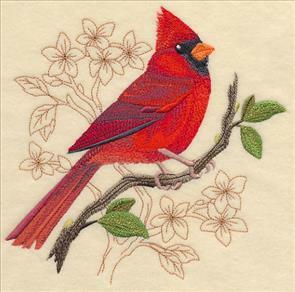 A cardinal and mountain bluebird are bright and bold against delicate branches. 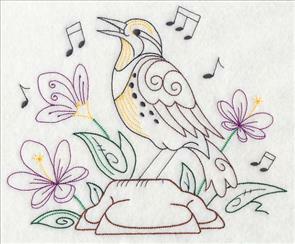 The background foliage in these designs is composed of running stitches with open areas. 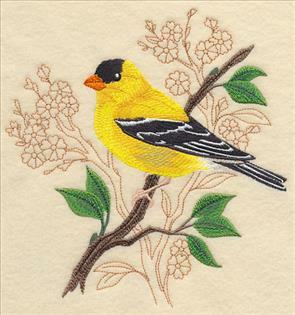 7.38" x 6.90" and 6.25" x 5.84" and 5.19" x 4.86"
A goldfinch and oriole bring spring beauty to your home decor. 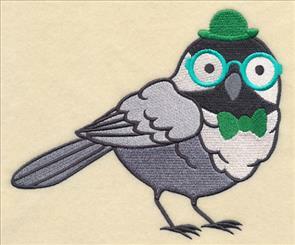 Nature lovers and bird watchers will adore these designs on tote bags and pillows. 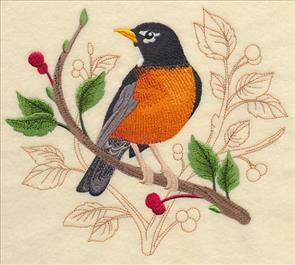 6.94" x 6.90" and 5.91" x 5.87" and 4.88" x 4.85"
A robin perches on a branch, peppered with berries. A meadowlark poses among his favorite goldenrod. 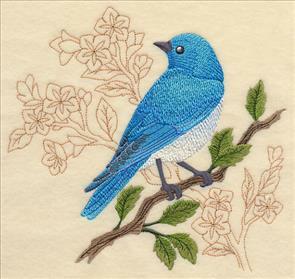 These designs are a beautiful balance of filled and open stitches. The birds are colorful in the foreground, while the branches and leaves in the background are light and open. 7.23" x 6.90" and 6.13" x 5.84" and 5.08" x 4.85"
Let your creativity take flight with these designs, and make something extraordinary for your home. Choose your favorites by using the links above, or buy the six birds and two nests in a design pack. 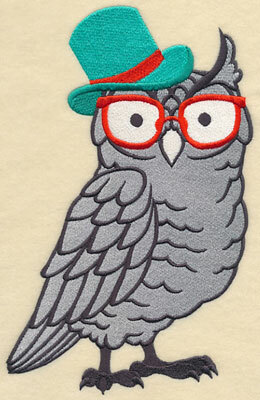 These cool and classy birds have style, and flair. 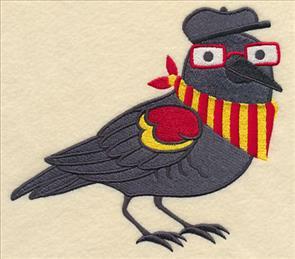 Hats, kerchiefs, and glasses have bold bits of color that contrast beautifully with grey and black feathers. Add these designs to bath towels, tote bags, purses, and more. 4.69" x 9.41" and 3.42" x 6.86" and 1.93" x 3.86"
A chickadee wears turquoise rims and a sweet green bowler. 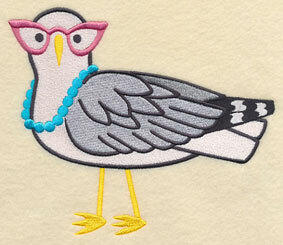 A seagull with beads and cat-eye glasses is a fun addition to beach bags and towels! 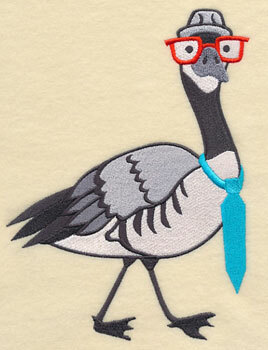 6.92" x 5.87" and 5.73" x 4.86" and 3.86" x 3.28"
A Canada goose brings style with a blue tie, while a red-winged blackbird is in fine fashion with a French beret and striped scarf. 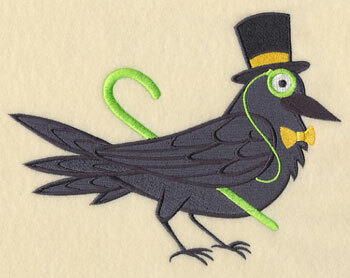 6.58" x 5.87" and 5.45" x 4.86" and 3.86" x 3.44"
A raven has a classic style with a cane and monocle. Charming on tote bags and pillows! 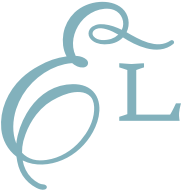 7.64" x 5.87" and 6.32" x 4.86" and 3.86" x 2.98"
These dapper birds will bring feathered fashion to tote bags, bath towels, and pillows. Choose your favorites by using the links above, or get the whole flock in a design pack! Vintage designs have a classic look. 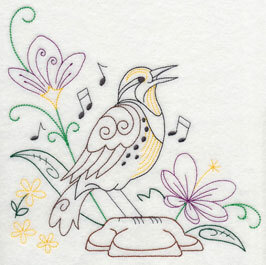 The open areas and stitch types used make them reminiscent of hand embroidery designs. With these types of designs, you can replicate the look of grandma's linens. 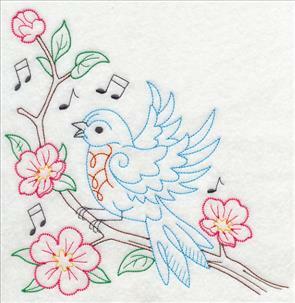 6.90" x 7.60" and 5.85" x 6.45"
7.74" x 7.80" and 6.89" x 6.95"
5.84" x 5.90" and 4.84" x 4.90"
Songbirds bring sweet melody to tea towels and table linens. The delicate stitches and open areas make them excellent choices for smooth, neutral fabrics. 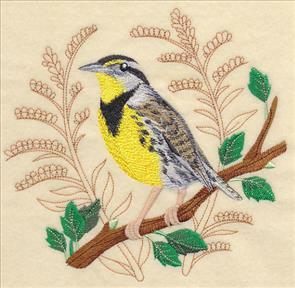 11.75" x 4.43" and 9.42" x 3.56" and 7.83" x 2.95" and 6.00" x 2.51" and 3.85" x 1.45"
Add crooning meadowlarks to placemats, table runners, tea towels, and aprons! Change the colors of the flowers to match your personal preference and taste. 7.82" x 7.83" and 6.85" x 6.85"
5.87" x 5.87" and 4.88" x 4.88"
8.32" x 6.85" and 7.12" x 5.86"
5.91" x 4.86" and 3.85" x 3.17"
This border features a signing meadowlark and spring flowers. 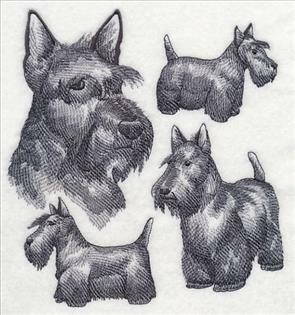 Beautiful on tea towels, quilts, and kitchen linens! 11.75" x 4.46" and 9.40" x 3.57" and 7.83" x 2.98" and 6.00" x 2.43" and 3.85" x 1.46"
The scarlet tanager is bright and beautiful. 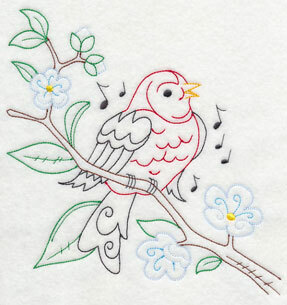 In these designs the bird sings sweetly in springtime flowers. 7.72" x 7.83" and 6.85" x 6.95"
6.85" x 7.04" and 5.87" x 6.03"
4.86" x 4.99" and 3.76" x 3.86"
Add the colorful border to placemats, table linens, tea towels, and quilts. Change the colors to coordinate with your home decor and personal preference! 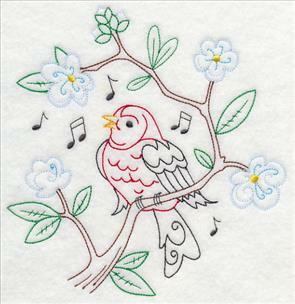 11.75" x 4.40" and 9.40" x 3.52" and 7.83" x 2.94" and 6.00" x 2.41" and 3.85" x 1.43"
Bring these sweet songbirds and their melodies to your embroidery projects today. 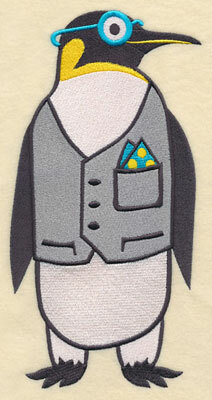 The light stitching makes them beautiful on smooth and neutral fabrics. Add them to placemats, linen napkins, aprons, tea towels, and more. Choose your favorites by using the links above, or get the whole flock in a design pack! It's available in five sizes to suit a variety of projects. Click a link below to see the designs included and price. Our list of requests for special designs grows larger and larger every day. We love hearing your ideas and suggestions! 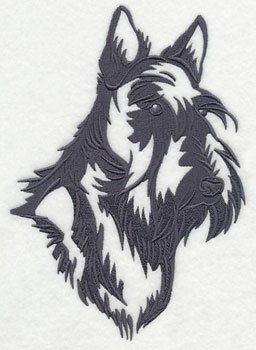 Dozens of embroiderers have requested designs of Scottish Terriers - Barbara, Sharon, Leona, Pat, Sandy, Diane, Fran....too many to list here! Thanks to all who requested this design, and for continuing to share your ideas with us! 5.84" x 8.24" and 4.85" x 6.84" and 2.76" x 3.89"